This display from Ballard Designs is so pretty with the huge bucket full of branches & baubles. I was waiting for those tiny glass ornaments to go on sale and they already have! We keep it fairly simple with ornaments: assorted silver ones from our wedding, keepsake ones from friends & family, and a little collection of colorful glass baubles handed down from my parents. I'd love to add these to the collection and keep them in the family for years to come. So beautiful. I'm loving the simple and chic Christmas decor this year. I love that bucket with just plain branches in it and colored ornaments hanging from it. 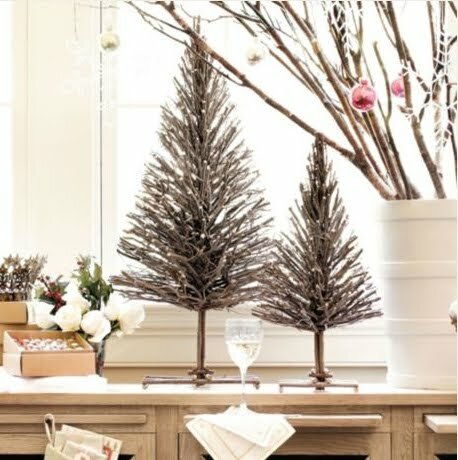 I love those plain branches too and might just have to give it a try in my kitchen. I have been debating between that and getting a mini tree and keeping it bare as there have been some pretty ones displayed like that too. I love Christmas because the ideas are endless! so lovely. i adore the colors choices! I love these! I have the perfect spot for them in my family room in a turquoise murano glass vase. Can't wait to get them--I ordered immediately!! B and I don't have a Christmas tree because we honestly don't have anywhere to put it. 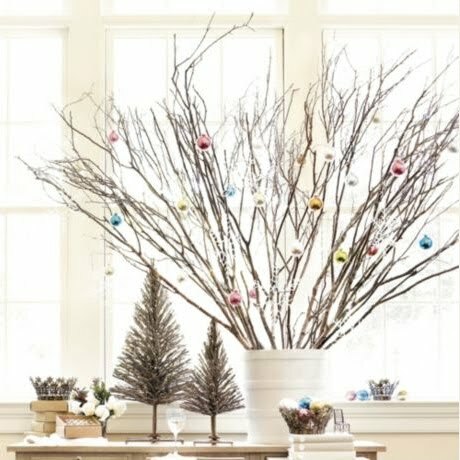 I love the idea of the simple twigs with little glass balls. Thanks for the inspiration! I love love love this! I hadn't thought of doing multiple single branches like this. What do you think, is this the 13" or 16" bucket from Ballard's?